How might our managing your mortgage and liabilities help increase your assets over time? Let’s look at how most families spend their hard earned money. Looking at the picture to the right, representing the average amounts families spend, you will see that committed expenses take up 52% of most family’s take-home pay. These are fixed costs such as your mortgage payment, insurance, etc. 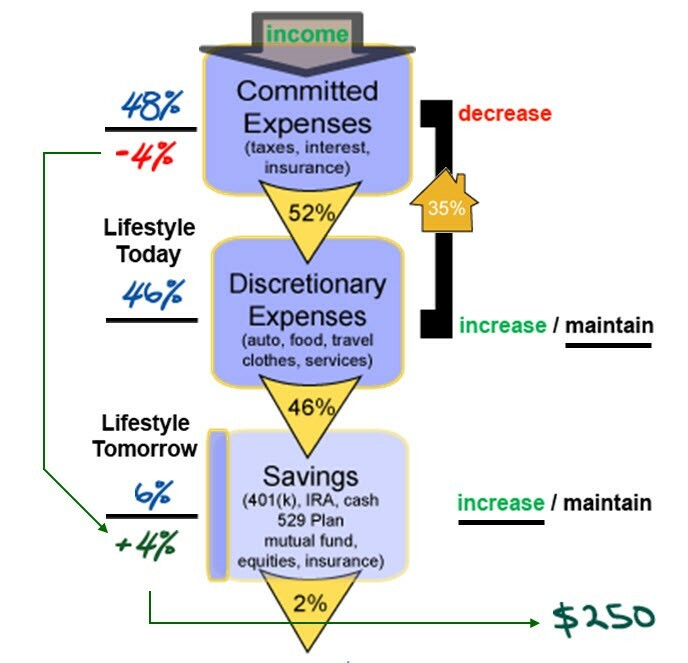 Discretionary expenses account for 46%. These two categories add up to 98% of the average family’s take-home pay. So what is left? On average, only 2% is left over to save for your future! What if we could help homeowners reduce their committed expenses by only 4% over time? Then, they would have the choice to either increase, or maintain what they spend on discretionary expenses or what they save for their “Lifestyle Tomorrow”! What difference can $250 make? What if, through proper liability management, we were able to help a homeowner free up an additional $250 per month? What could that mean to their future? 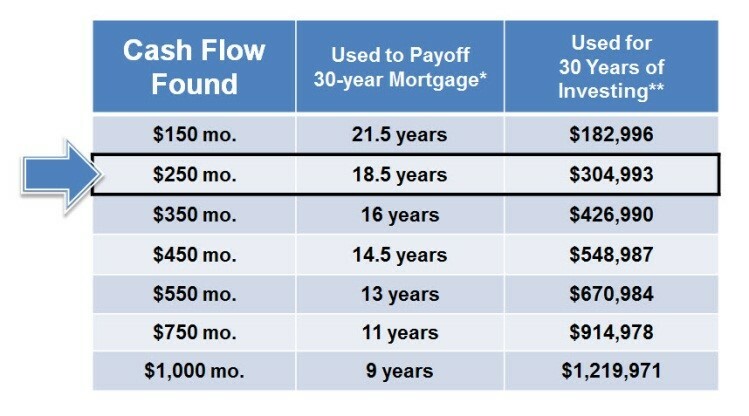 Looking at the graph, you can quickly see that $250 more per month toward a 30-year mortgage could pay it off in 18.5 years! Or, if saved, could add up to nearly $305,000 over 30 years! *Assumes 30-year fixed mortgage, 7% interest rate. **Assumes 7% after-tax rate of return. Whether it is $50 or $250 or $1,000 per month, we know that helping our clients manage their liabilities will help them improve their monthly cash flow over time, ultimately allowing them to save more for their future and create a better “Lifestyle Tomorrow”! This entry was posted in Blind Spot 2: Increasing Fiscal Literacy, Blind Spot 3: Storing Money Efficiently and tagged developing a plan, financial future, goals and dreams, home loan, home loans, increasing fiscal literacy, investments, lenders, lending, loans, money, mortgage, mortgage lenders, Portland Real Estate, Refinancing, saving money, wealth. Bookmark the permalink.